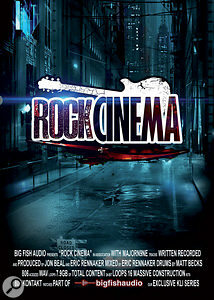 Rock songs have been used by film-makers in countless different ways over the years, so the title Rock Cinema could mean just about anything. A contemporary film might, for example, include flashbacks requiring songs in the style of those from the 1950s or '60s; or a director might decide to ignore the era the music comes from and use it because its feel suits the mood of the scene. In those terms, Rock Cinema's scope is narrow. The tracks never stray far from Coldplay territory, and are tailored to suit film and TV projects whose youthful audiences would probably think you were greeting them in Polish if you said Polanski, Hitchcock, Cronenberg or Kubrick. 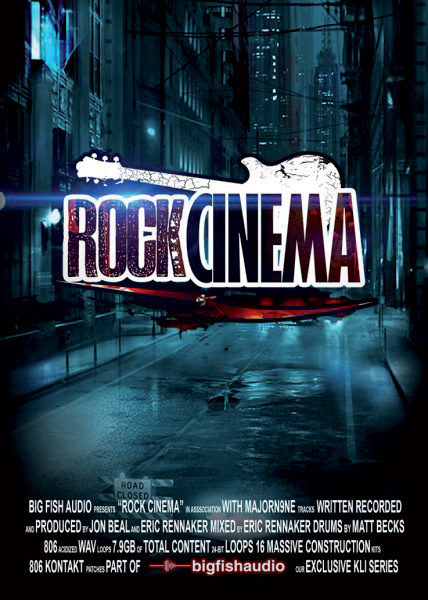 Rock Cinema also adheres very strictly to the construction-kit format, providing 16 kit compositions that can be arranged in various ways, or simply plundered for their individual samples and loops. The content, amounting to nearly 8GB in total, is formatted as Apple, REX and Acidised WAV loops and for Kontakt and Stylus RMX, and there are 806 loops in each format. As we are dealing with rock, inevitably most of the samples are of drums, bass and electric guitar parts, accompanied here and there by synthesizer lines, pads and, very occasionally, a tambourine and/or shaker. Pianos and organs make cameo appearances in many of the kits, as does a retro-sounding, ping-pong-delayed Rhodes piano, but aside from a few Theremin and white-noise loops, there are no samples that could be described as being particularly unusual. Guitar samples undoubtedly make up the majority of the samples in each kit, labelled for song construction purposes as breaks, swells, pickups, intros, choruses, verses and ends. Most kits also provide a number of alternative guitar setups, so if, for example, the riff is good but its sound doesn't fit, there's a fair chance of finding an alternative version of the riff played using a very different tone. Rock Cinema helpfully uses file names that leave one with little doubt as to the kind of guitar sound employed in each case. These include lead, main, heavy, electric, high note, low, acoustic, strum, noise, tremolo, reverse, palm-muted, delay and guitar effects. Just as these titles suggest, there is plenty of variety and, in the case of the reverse and delay guitar setups, a number of experimental 'soundscape' options too. Separate from the kits is the Drum Tracks folder, which comprises the discrete hi-hat, kick, snare, toms, overhead and room mic recordings for each of the 16 kits. Collectively, these samples are some of the most interesting drum loops I've heard, largely because the engineering is quite inconsistent, even within kits. Some recordings are pleasantly noisy while others are heavily gated. Most seem to have been processed using plenty of EQ, although one or two, particularly the room recordings, have a more natural feel. Rock Cinema does not include something for everyone, and only serves up a certain kind of rock for a particular brand of cinema. Nevertheless, within those parameters it actually offers a lot of variety, and will be an absolute Godsend to any composer who is constantly being asked for music that sounds 'a bit like Coldplay'. 2 weeks 21 hours ago.